Mertensia arizonica (45x40,Z4,P,L,3:8w) .......................................................................... 20 seeds / $4.00 07460.28 (W) Iron Co., UT, 11050ft, 3368m. From a crown sprout twenty to thirty stems bearing ovate leaves and large pendant clusters of blue and pink flowers. 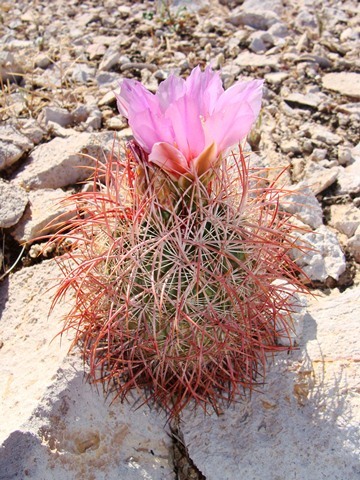 Similar to a dwarf M. ciliata. 30986.18 (W) Mesa Co., CO, 9100ft, 2774m. A choice dwarf species with silvery leaves covered with stiff hairs on the upper surface and tightly-packed, nodding clusters of long, bright blue trumpets. W-facing, subalpine slopes of gravelly loam. Mertensia ciliata (Boraginaceae) (90x40,Z3,P,L,3:8w) .................................................. 30 seeds / $3.50 12564.24 (W) Gunnison Co., CO, 9980ft, 3043m. One of the tallest Mertensias -- this population is about hip-high. 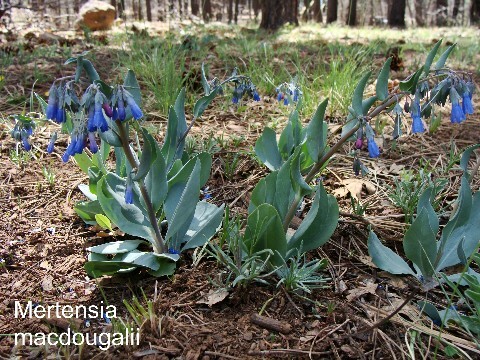 Wide, bluish-gray leaves, typical pendulous blue bells. 90584.48 (W) Park Co., WY, 7700ft, 2348m. 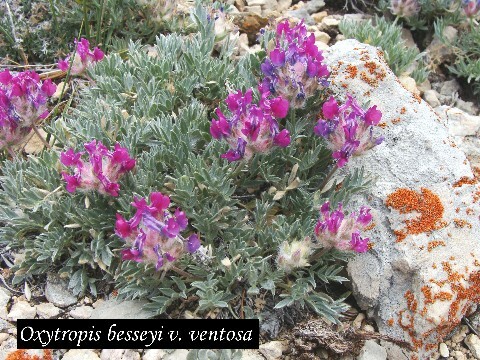 Robust population with wonderfully-hairy leaves on both sides, like velvet. Nodding blue flower bells. On gravelly loam over limestone substrate. Mertensia viridis (18x28,Z3,P,C,3:6w) ....................................................................... 30 seeds / $4.00 90584.33 (W) Carbon Co., WY, 7650ft, 2332m. 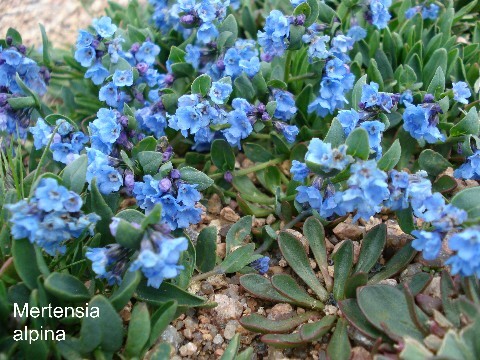 This robust population displays nodding clusters of beautiful, deep blue to pink bells terminating stems clothed in a few lanceolate, glabrous, green leaves. Michauxia campanuloides (Campanulaceae) (120x35,Z5,B,L,1) ............................. 100 seeds / $4.00 12167.14 (W) Anamur to Alanya, Turkey. From a rosette of bristly, toothed, lanceolate leaves erupts a stout raceme bearing myriad pendant white flowers with reflexed petals tinged purple on the reverse. A showstopper in full bloom. Mimulus aurantiacus v. pubescens (Scrophulariaceae) (40x30,Z8,P,L,1) ............... 100 seeds / $3.00 08753.15 (W) Ventura Co., CA, 1800ft, 550m. Flowers not seen, probably in the orange range. Herbarium records seem to indicate this variety is prevalent here. 10543.25 (W) Esmeralda Co., NV, 7200ft, 2195m. Squat, glandular plants with cuspidate, overlapping leaves. 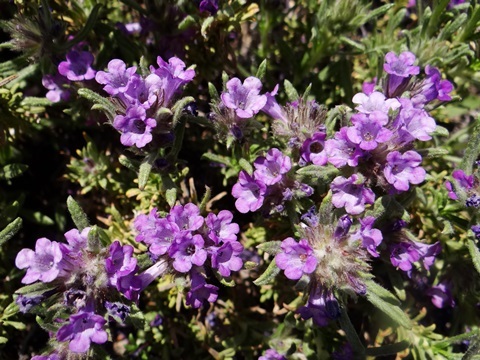 Deep magenta flowers with gold-speckled, white-bearded throats protrude from every axil. 12184.10 (W) Butte Co., CA, 1600ft, 488m. Sticky foliage bears intense red blossoms in every axil. 12986.15 (W) Wheeler Co., OR, 3300ft, 1006m. Globes of sticky foliage, flowers of luminous rose-pink. Mimulus guttatus (Scrophulariaceae) (12x20,Z3,P,L,1) ................................................ 100 seeds / $3.50 32988.24 (W) Gunnison Co., CO, 10500ft, 3201m. Bright yellow flowers with orange spots in the throat, very floriferous. Along the margins of and in the stream from an alpine lake spillway. 50968.10 (W) Sherman Co., OR, 250ft, 76m. Viscid herbage bearing multitudes of small yellow, orange-speckled flowers. Creeps up and down vertical basalt walls. Mimulus lewisii (60x28,Z3,P,L,1) .................................................................................... 100 seeds / $3.50 54402.18 (W) Carbon Co., WY, 9750ft, 2973m. Bicolored flowers of magenta to rose with yellow throats. 54988.11 (W) Farellones, Reg. Metro., Chile, 6400ft, 1951m. Large yellow flowers sporting a prominent red blotch on the lower lip. 70755.14 (W) Siskiyou Co., CA, 6100ft, 1860m. Mats of hundreds of yellow, orange-blotched flowers. 74568.06 Robust plants with smooth stems and toothed leaves produce hundreds of blue to lavender flowers for weeks in late summer. Minuartia laricifolia (Caryophyllaceae) (12x20,Z5,P,L,1) ............................................... 100 seeds / $3.50 54184.01 Mats of acerose leaves bear starry white flowers in spring. Good for crevices. 09867.08 Handsome plants with hairy foliage and whorled stems of pink flowers. Monarda bradburiana (Lamiaceae) (50x20,Z4,P,L,3:8w) ............................................. 100 seeds / $3.00 10771.06 A wonderful, minty, dwarf Bee Balm with heads of pink flowers from late spring deep into summer. 70322.21 (W) Harding Co., NM, 4500ft, 1372m. Skewered cream, pale pink or pale lavender heads. 54772.07 An odd plant from alpine regions in Bhutan with spiny leaves in whorls and heads of numerous pink and white flowers in interrupted whorls. 12174.20 (W) Josephine Co., OR, 1700ft, 518m. Clumps of grass-like foliage bear racemes of greenish-yellow, starry flowers with woolly stamens. 12775.19 (W) Pecos Co., TX, 5800ft, 1768m. JRT4175 Cylindric, semi-clumping small barrels with short, black centrals, woolly towards the apex. 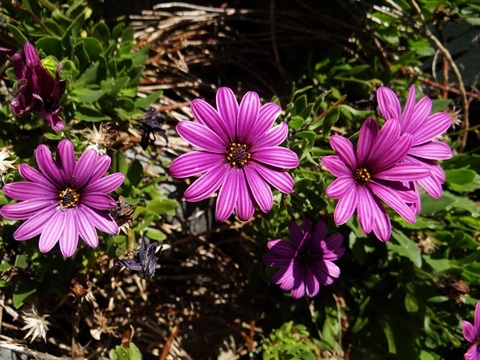 Wide-petaled, magenta flowers. Nicotiana glauca (Solanaceae) (250x120,Z8,P,L,1) ..................................................... 100 seeds / $3.50 32552.25 (W) Riverside Co., CA, 2000ft, 610m. Small trees with ovate glaucous-blue leaves and clusters of primrose-yellow tubular flowers. 10552.18 (W) Mohave Co., CA, 3200ft, 976m. Magnificent cream spires over globes of narrow, sharp leaves. 56532.29 (W) Coconino Co., AZ, 6400ft, 1951m. Long panicles of creamy flowers soar over coarse clumps of grass-like foliage. 58376.25 (W) Lane Co., OR, 5600ft, 1707m. 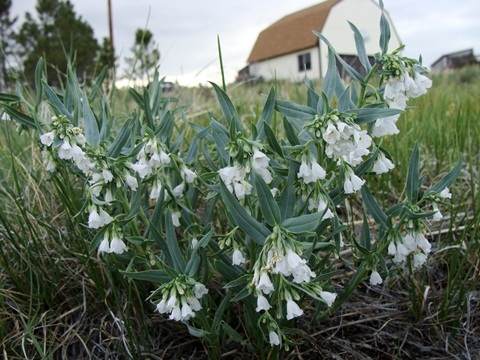 A Penstemon cousin with flattened, violet-blue flowers in a panicle over coarsely-serrated leaves. 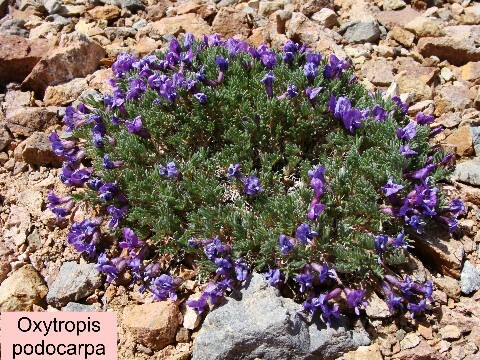 The lower flower lip is often paler, such as lavender. Oenothera caespitosa v. crinita (Onagraceae) (8x15,Z5,P,L,2) .................................... 40 seeds / $4.00 12043.18 (W) Millard Co., UT, 6000ft, 1829m. Long leaves vary in dentation but are always hairy, creating handsome furry tufts. Large white rounded lowers turning pink to violet as they fade. On calcareous sandy rubble. 56142.27 (W) Hill Co., TX, 1200ft, 366m. Large bright yellow flowers arising from the base, followed by huge winged fruits. 70142.16 (W) Elbert Co., CO, 6650ft, 2027m. (=Artemisia campestris.) Tufted clumps of finely-cut, velvety-pubescent, blue-gray leaves. Dense spikes of insignificant flowers. This taxon was split into O. caudatus which is plain green, and O. pacificus which has by far the more attractive foliage. 12553.15 (W) Socorro Co., NM, 4900ft, 1494m. Silver-gray mats of globose stems covered with dagger-like spines with reddish banding. Yellow flowers in early summer. Opuntia cyclodes (40x120,Z6b,P,C,2) ............................................................................... 30 seeds / $3.50 12978.15 (W) San Miguel Co., NM. JRT5900 Giant, O. englemannii-type plants with beautiful, thick, light-green-blue-tinted pads covered with golden-yellow spines and glochids. Large, solid-yellow flowers with fruits that turn a dark purplish-red when mature. 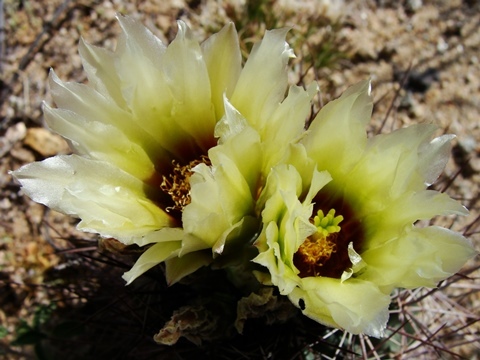 Opuntia heacockiae (Cactaceae) (10x30,Z4,P,C,2) ...................................................... 50 seeds / $4.00 35214.24 (W) Chaffee Co., CO, 8680ft, 2646m. 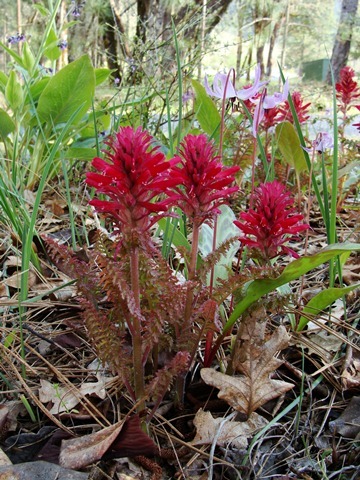 A localized dwarf variety of O. polyacantha, slowly sprouting pads along horizontal root runners. Yellow flowers. Opuntia hystricina (20x60,Z5b,P,C,2) ............................................................................... 30 seeds / $3.50 35988.17 (W) Navajo Co., AZ, 6000ft, 1830m. JRT8950 The long white spines are so thickly clumped as to obscure the stems. 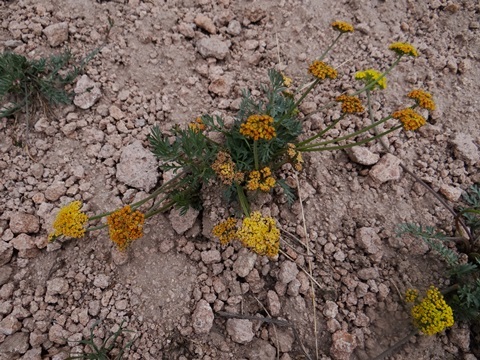 Flowers not seen but are usually yellow. 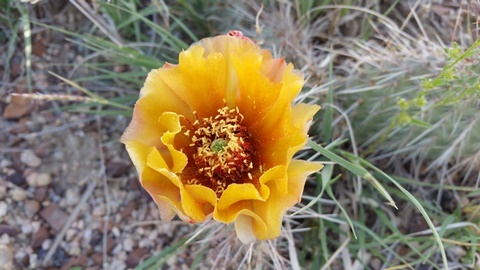 Opuntia phaeacantha X macrorhiza (Cactaceae) (45x60,Z5,P,C,2) .................................. 25 seeds / $3.50 70362.16 (W) Baca Co., CO, 4400ft, 1341m. 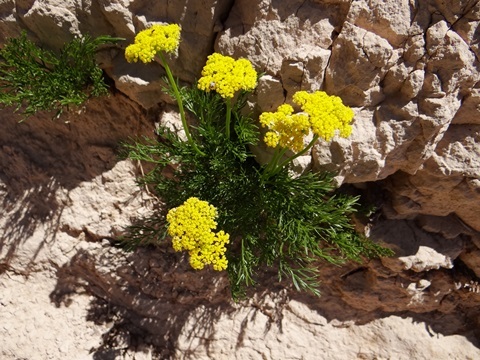 DB Vigorous plants with pure yellow flowers, growing on sandstone. Opuntia phaeacantha X macrorhiza (Cactaceae) (45x90,Z6,P,C,2) ................................. 30 seeds / $3.50 70362.26 (W) Kane Co., UT. 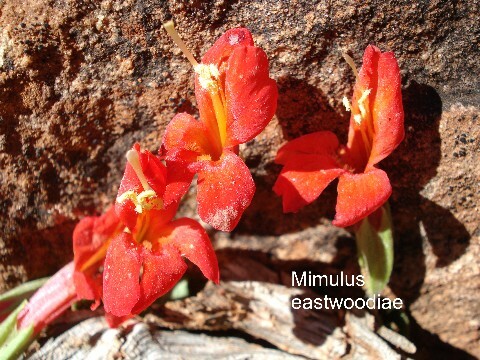 DB Similar to the preceding but with red flowers on somewhat larger plants. Opuntia phaeacantha X macrorhiza "woodsii" (Cactaceae) (60x120,Z7,P,C,2) ................ 30 seeds / $3.50 70363.16 (W) Washington Co., UT, 4200ft, 1280m. DB Very large plants with pink to red flowers. 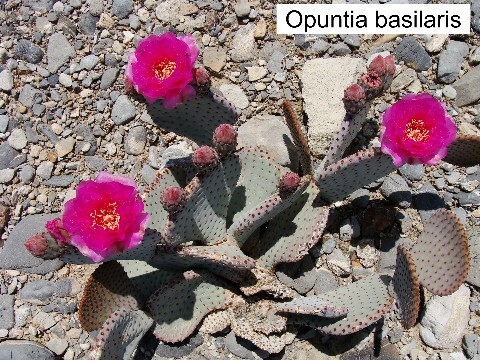 Opuntia phaeacantha X polyacantha (55x110,Z5,P,C,2) ............................................. 35 seeds / $3.50 70364.16 (W) Baca Co., CO, 4400ft, 1341m. DB Round, shiny pads with long, straight brown central spines bear banana yellow flowers with red filaments. 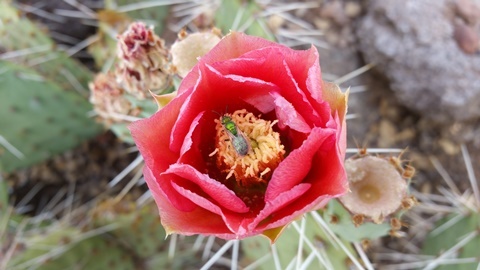 Opuntia phaeacantha X polyacantha ssp. hystricina (30x90,Z5,P,C,2) ................... 20 seeds / $3.50 70365.16 (W) Coconino Co., AZ, 4000ft, 1220m. DB Pink and yellow-flowered plants in this population. 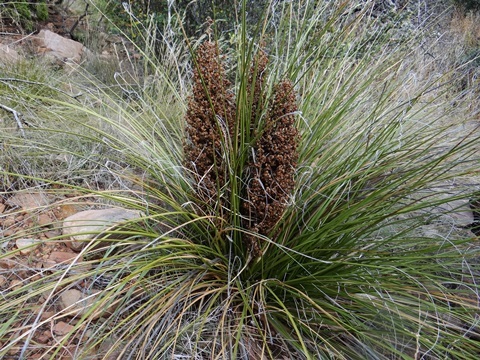 Large, sprawling plants with pads sporting dark brown centrals at the base of each spine, fading to white. 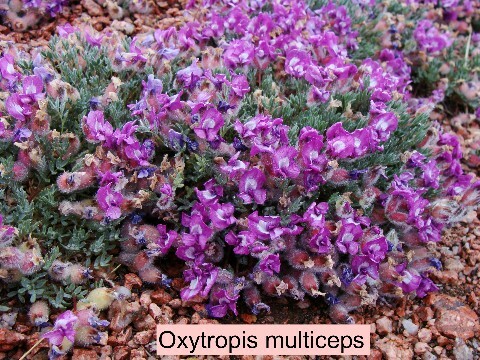 Growing on Navajo sandstone. Opuntia X phaeacantha (30x90,Z5b,P,C,2) ................................................................. 30 seeds / $3.50 70361.25 (W) Socorro Co., NM. JRT5901 Giant bluish-green-tinted pads with nice black spines contrast with the red-centered, bright yellow flowers. Dark red fruits in late summer. 70784.25 (W) Uintah Co., UT, 5300ft, 1616m. 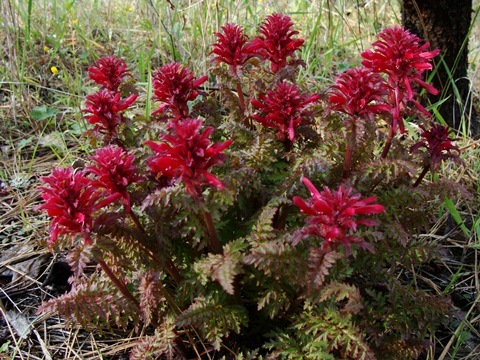 Similar to my 1998 Rio Blanco Co., CO collection with beautiful strawberry-red flowers. 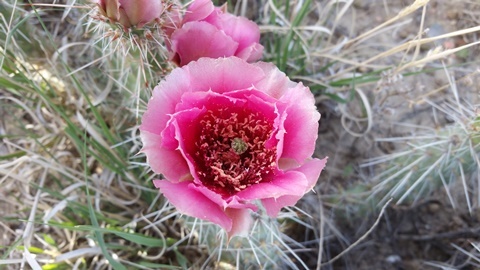 There is some variation from deep pink to magenta. 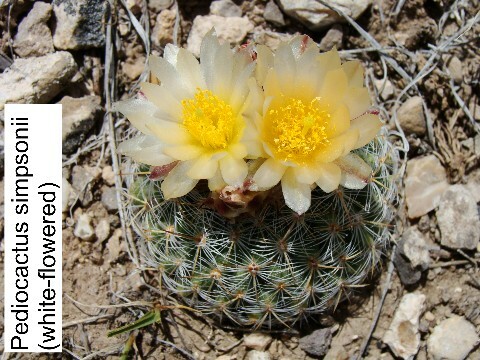 Opuntia pulchella (Cactaceae) (14x25,Z5,P,C,2) ...................................................... 20 seeds / $5.00 70984.21 (W) Washoe Co., NV, 4020ft, 1226m. Multiple cylindrical stems with dagger-like, white centrals, bearing apical pink to magenta flowers. On outwashes of white granite screes. Opuntia X tortispina (Cactaceae) (60x90,Z5,P,C,2) .................................................... 40 seeds / $3.50 78804.16 (W) Fremont Co., CO, 6000ft, 1830m. DB Large plants with pads up to 10" across bearing twisted and angled spines and yellow flowers. 00476.15 (W) Inyo Co., CA, 6800ft, 2073m. Covered in long, white, flexible spines. Yellow flowers. Opuntia X vaseyi (100x120,Z8,P,C,2) .......................................................................... 20 seeds / $3.50 90206.16 (W) Riverside Co., CA, 3200ft, 976m. DB Very dense diamond shaped pads with light brown spines and red flowers. Oreoxis alpina (Apiaceae) (3x5,Z3,P,C,4:12w) ............................................................... 40 seeds / $4.00 18470.14 (W) Lake Co., CO, 12000ft, 3660m. Tiny caespitose tufts of bipinnate, linear leaves covered with short hairs ("hirtellous"), giving an overall ashy-gray sheen to the plants. Small yellow flowers on short stems transform into small balls of seed. 12185.07 (W) ex Little shrubs of grayish-white, woolly leaves and lots of pink flowers. 54042.07 Showy heads of red-purple bracts with long-tubed pink flowers. Burgundy leaves. 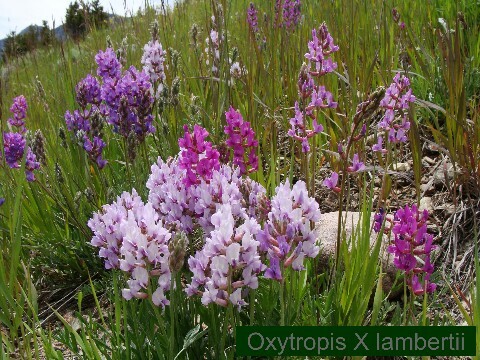 Oxytropis campanulata (Fabaceae) (18x16,Z4,P,SC,1) ................................................ 60 seeds / $3.00 12187.01 Tightly-packed, erect heads of magenta-purple over pinnate, green plants. A Russian native. 12186.14 (W) Lake Co., CO, 12050ft, 3675m. Silvery, pinnate foliage and short racemes of creamy yellow from black, woolly buds. 54186.17 (W) Elbert Co., CO, 6650ft, 2030m. Flowers in shades of magenta, maroon, ruby and rose. 56362.04 Whitish hairy tufts bear scapes of bluish-purple to reddish-violet. Rare Hokkaido native. 58188.13 (W) Carbon Co., WY, 6400ft, 1950m. 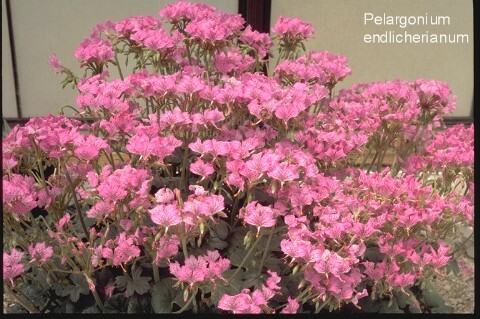 Large-flowered racemes from rosy-purple to white flushed pink over matted, woolly tufts. Great Wyoming endemic. 67438.18 (W) Beaver Co., UT, 11100ft, 3384m. Very condensed cushions of bluish-gray, silky-hairy, pinnate leaves. Purple, bluish or red-violet flowers, depending on age. On W-facing, wind-blown ridge crests of volcanic rock. 70204.15 (W) Park Co., CO, 12250ft, 3735m. Tufts of silvery, pinnatifid leaves. Compact spikes of lavender-purple. 76404.49 (W) Daggett Co., UT, 7450ft, 2271m. 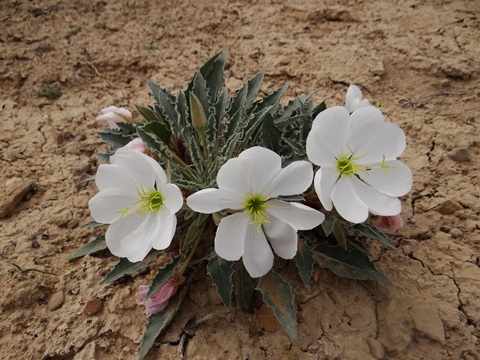 Dwarf plants at this locality with large racemes of pure white, fragrant flowers. 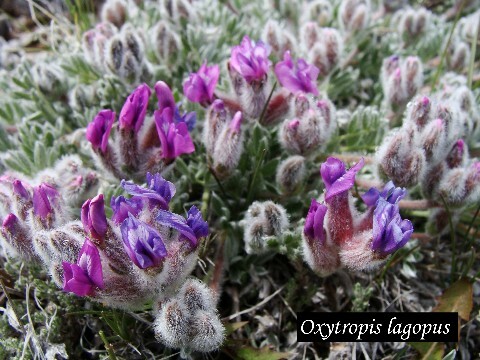 Oxytropis splendens (Fabaceae) (16x12,Z3,P,SC,1) ........................................................ 100 seeds / $3.50 76722.25 (W) Park Co., CO, 10925ft, 3362m. Whorled, silvery leaves with woolly heads of pink. Papaver kluanense (Papaveraceae) (10x8,Z3,P,L,3:4w) .................................................. 100 seeds / $4.00 52562.15 (W) Summit Co., CO, 12475ft, 3803m. Pale yellow to yellow-orange poppies grace hairy, cut foliage tufts. 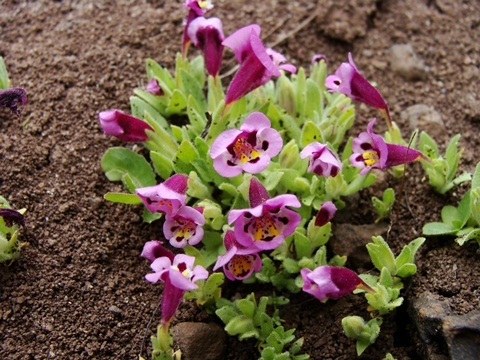 An attractive alpine dweller for the cooler side of your rock garden. Parnassia palustris (Saxifragaceae) (12x5,Z4,P,L,3:8w) ............................................. 100 seeds / $3.50 70197.16 (W) Dolomites, 6850ft, 2090m, Italy. Tufts of small, fleshy, heart-shaped leaves bear short spikes with white, veined flowers, delicately fringed with stamens. 58955.88 (W) Park Co., WY, 10400ft. One of the best alpine Crucifers I have come across. Rosettes of dark-green, slightly-clammy, toothed leaves with tight clusters of bright rosy-pink, lilac-scented flowers. On W-facing, steep, dolomitic screes. Pedicularis crenulata (Scrophulariaceae) (18x9,Z4,P,C,3:12w) .................................... 100 seeds / $3.50 12763.16 (W) Chaffee Co., CO, 11250ft, 3430m. 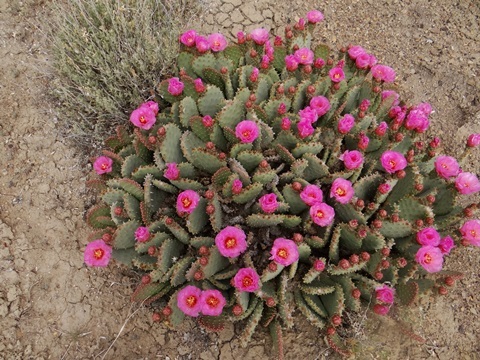 Mounds of finely-divided leaves sprout spikes of rosy-pink to rosy-purple flowers. Wet road embankment near timberline. Pediocactus simpsonii (Cactaceae) (5x7,Z4,P,GL,3:4w) ..................................................... 40 seeds / $3.50 76597.54 (W) Sevier Co., UT, 7640ft, 2329m. 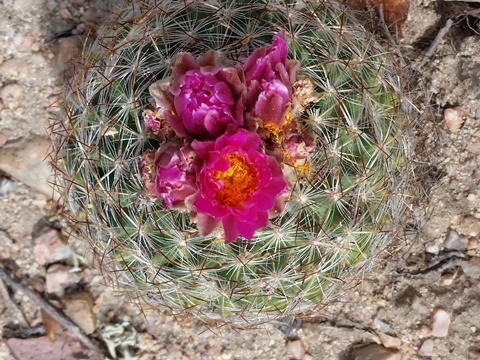 Small barrels here with mostly reddish-black spines, flowers not seen but are probably pink. Growing on a gently-sloping, E-facing, dry montane meadow. Pediocactus simpsonii (pink fls) (Cactaceae) (4x8,Z4,P,GL,3:4w) .................................... 30 seeds / $3.50 76597.75 (W) Douglas Co., CO, 6650ft, 2027m. Small solitary barrels with bright, deep pink flowers. Very nice form here on sandy rimrock. It was a cold day in late April, 2015 when I found this barrel just coming into bloom. 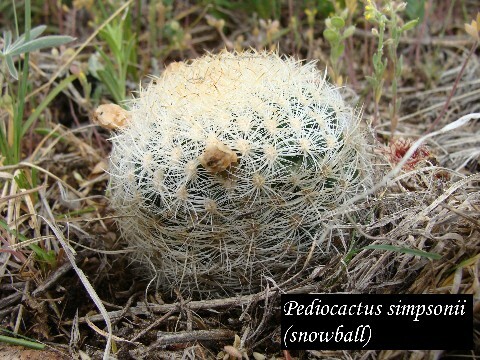 Pediocactus simpsonii v. indranus (Cactaceae) (3x6,Z5,P,GL,3:8w) .......................... 40 seeds / $4.00 76595.12 (W) Custer Co., ID, 6375ft, 1944m. 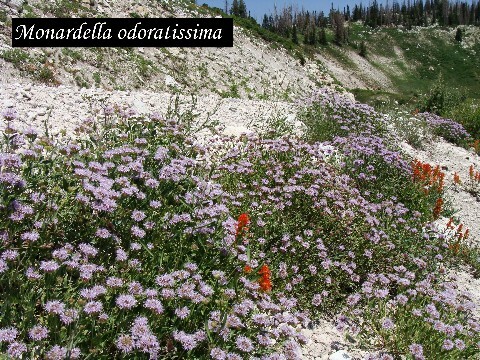 Small, flat barrels, often multi-headed, with pale pink flowers, on limestone alluvium. 76418.19 (W) Gila Co., AZ, 2100ft, 640m. "Fountain Grass." 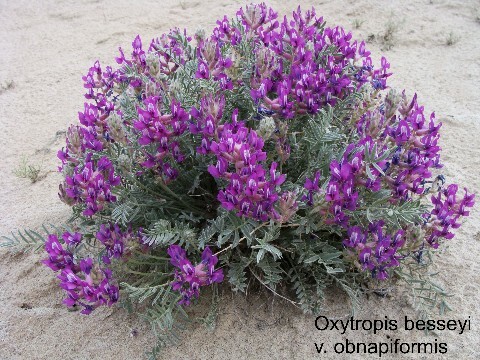 Naturalized along some roads in Arizona, this beautiful grass has nodding, foot-long, hairy spikes which emerge purplish and age paler as they extend.